The JASDF tends to follow the European model of producing show planes. For instance, they like to not only do anniversary schemes, but also will often produce some nice artwork for air shows. That is what we have on this set. There are three scheme options on this sheet. All of the aircraft are in the standard F-15 color scheme of FS 36320/36375 and not the US Mod Eagle colors. The first option is for the Chitose Air Base open house in 2012. This plane has a large growling bear on its fin. This is appropriate as Chitose is on Hokkaido, where there are still bears in the woods. The next is the first of two 30th Anniversary schemes. This one is carries bear motifs on both the fin and the nose section. The final option is a two seat F-15DJ and has a much more complex scheme. The black fin carries a more colorful version of the previous scheme. Same for the nose. On the upper fuselage/wing is a huge bear paw in black. 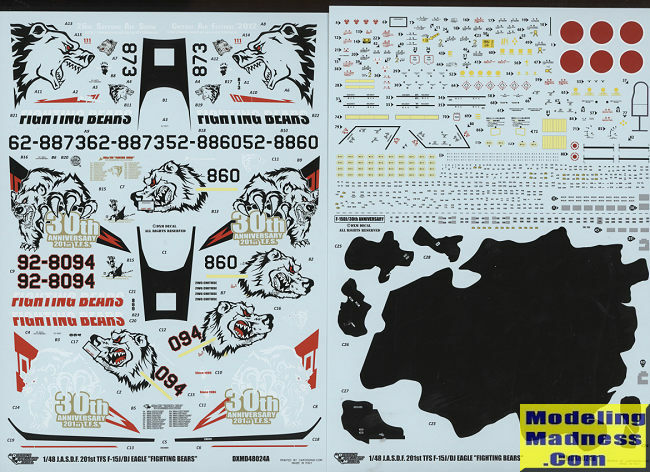 The decals are superbly printed by Cartograf and you are provided excellent full color instructions that includes an extensive data placement guide. Note that on the DJ, some of this data is in white so pay attention. 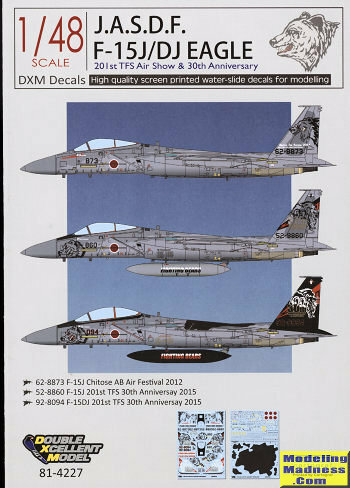 Hasegawa does a very nice 1/48 F-15J/DJ that is not difficult to locate. Review sheet courtesy of http://www.thepmw.com.